We often hear the question: how can an operator (importer) be accepted as an international airline and be VAT-exempt during an aircraft importation and where are the best conditions available? A European Court of Justice (ECJ) judgement from 2012 often referred to as “the Finnish case” have set the standard in 2012. The judgement said that the aircraft must be used by an accepted international airline – but how has this term “used” been interpreted. We have therefore commissioned a verification survey in various EU member states known for aircraft importation. The survey has been made by an international consulting firm. The result is muddy as could be expected. All EU member states basically agree that an AOC is mandatory, and the majority of all traffic must be international. But when it comes to the “usage” requirements for a specific aircraft the result varies. The mentioned judgement did not mention anything about a requirement for commercial usage, but this requirement is specified in a later EU working paper 758 from the European Commission VAT Committee and their published guidelines, so we expect that this usage issue eventually will end up at the ECJ for a new interpretation – as such a huge variation in the preconditions is not acceptable in the long run. The two OXFAM tax havens states Ireland and the Netherlands have the lowest thresholds for an aircraft to be accepted as VAT-exempt. The Netherlands also accept aircraft as VAT-exempt for certain company groups even though no AOC/charter certificate has been acquired. The latter do not have any foundation in the mentioned ECJ judgement or EU working paper and is clearly illegal in our opinion. Again, we see these low thresholds as an abnormality that the EU Commission will not accept in the long run. If you opt for procedures offered in these EU tax havens you MUST ask for a written approval available from all authorities in all member states. It is unclear whether or not the EU Commission is aware of this malpractice and will eventually pursue this. The practice is not legal in our opinion. What are the local preconditions for respectively the importer and the specific aircraft? This table contains the results of our examination in seven EU-countries of how an aircraft operator can be accepted as an international airline and thus be VAT-exempt during an aircraft importation. The answers are based on the answers received from an international consulting firm in the respective countries. All the above answers do only relate to VAT – not the customs duty part. An airline/commercial operator operating in EU member states that actually follows the guidelines from the European VAT Committee are experiencing fierce and unfair competition when competing against airlines/commercial operators that do not have to use their aircraft 100% commercial in order to achieve the 0% VAT through the airline VAT exemption because their aircraft have been imported through a non-complying EU member state. The same non-complying member states also often allow a lessee the right to reclaim/defer any VAT imposed during an importation (please see survey 4). 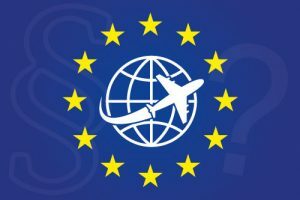 This makes the competition unfair for aircraft owners and operators operating in EU member states that actually follows the guidelines from the European VAT Committee. Competition between the EU member states is sound, but the competition becomes unfair when the guidelines from the European VAT Committee are not followed by all member states. Some member states do not follow the EU standards or guidelines, and this is often sanctioned by their local tax/customs authorities in order to offer a better business environment or to create local gateways for certain industries. These jurisdictions are known to bend the rules in favor of local companies, often by only implementing a light version of any new regulation or by simply ignoring or delaying the required implementation.